Aiya...cannot go McD Playland ah...Never mind la. I create my own Playland. My own mini slide....Up up and away...jump! Scared of Mamarazzi being angry? Easy...I sing her a song. "Oh Mama! Mama Don't Be Angry~ For I Only Only Naughty~"
Here is a video of me singing "Oh Mama". Still angry? 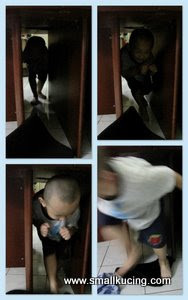 Nevermind..I sing my kau lui song.."Kan Kor Lai" siap with the gelek-gelek bum-bum. Sure won't be angry liao. but.. haha.. when he gelek, super adorable! 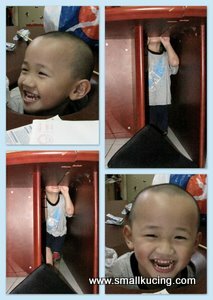 M E L T...... he is sooooo adorable! I can see he is having a great time. At least he will exhaust some energy.. Hope you have a great weekend..
Hahahahahaha... ada bakat jadi Shah Rukh Khan Jr. LOL! Naughty! Naughty! Kesian your mama have to pick up all the things when you're bored of playing... Hmmmm...lock you in dark storeroom better - no monkeying around. LOL!!! 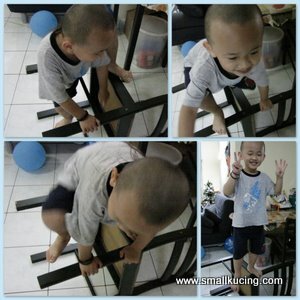 funny lil boy.. what stunt is that hahahaha..habis la rumah mamarazzi lepas ni..
Ha... 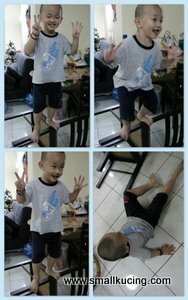 He is super active. 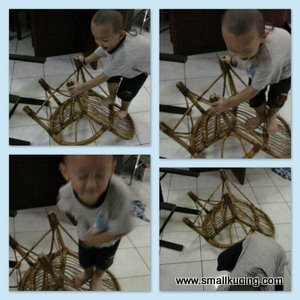 As long as he does not hurt himself, its fine playing with the chair, can see how fun it must have been for him. 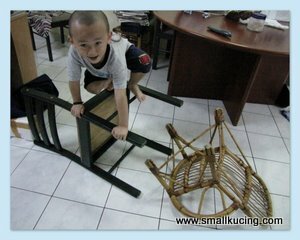 aiyoh, aunty see also heart wanna jump out lah...so dangerous playing with chairs..dont do that again ok..guai guai sit down and read books kan better choice..
Oh my goodness! He is SO ADORABLE! I am just in love with him singing and dancing! Own play gym, very creative! Did u rotan him after all these stunt?